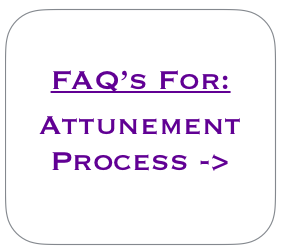 What Happens During An Attunement? Attunements are normally a very satisfying and very peaceful experience in which the recipient opens themselves up to receive love and divine light. The energies are then received within your energy and there will be some necessary adjustments to your energy system in the days following. You may sit upright or lie down, as you wish, with the key being that you always open yourself up to receive the healing and attuning energies with love and gratitude. This is normally experienced as a very peaceful, relaxing and loving experience as you allow the healing energies to wash over you and create a place of stillness from within. All that is required is that you use your intention to accept the attunement and then simply rest, relax and enjoy the divinely guided energies as they are being brought into your consciousness for your own highest & divine purpose. With most attunements, you will then be able to access the divine energetic healing frequencies in your own self-healing or meditative practices and you may also then practice with these energies with others. The introduction to these types of energy based healing practices, especially for people learning these for the first time, can be a very special and empowering experience as the healing energies can now be called on directly by themselves for whomever they wish.